Georgian style 32mm spindles from the Trademark hemlock range of stair parts. Turned spindles with an attractive design. Trademark stair parts in hemlock are a flexible selection of high quality yet affordable stair parts that can produce a stunning continuous handrail with the attractive sweeping lines of over the post balustrade. The Trademark range offers plenty of choice with options for 41mm or 32mm spindles, making them perfectly crafted and scaled to make almost any size home feel special. Hemlock is a natural timber that’s similar to pine but without the knots. A little stronger than Pine, Hemlock is usually a creamy grey to pale brown softwood with straight grain which is ideal for painting, varnishing or polishing, making it an excellent choice for stairs. In this Trademark range, the Hemlock parts are expertly crafted into exquisite over the post stair parts to give you a staircase that you and your family can enjoy for many years. 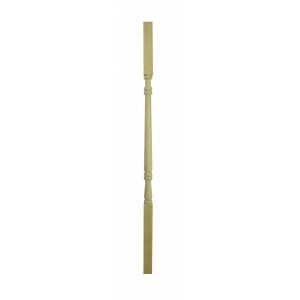 Spindles in this range are available in a variety of baluster designs, including basic Plain Stick and Stop Chamfer balusters, as well as sophisticated Windsor and Georgian turned Spindles in 900mm lengths for the stairs, and 1100mm lengths for landings. The tulip newel turnings suitable for continuous handrails are 675mm long. These handrails look particularly elegant when finished with a decorative volute, with volute newels that are 890mm in length. Plain newels, newel bases, complete newels, winder newels, intermediate newels, all available in the Hemlock, complete the Trademark range of stair parts.